Two hundred years ago a German musicologist came within an ace of inventing the term 'easy listening', and applied it in his definition of divertimento, a loose term that avoided the more serious connotations of symphony or sonata. It is typical of that impish cheek we now know so well in Mozart, that he was perfectly able to serve his most profound music in the ironic guise of divertimento, as with K563 (Hyperion CDA67246). The present earlier works [both for two horns and strings] show something of the same disposition, since it is very likely that they were occasion pieces, for occasions—possibly outdoors—at which we can imagine that the audience had other social concerns on their mind; thus he fills the music with quirky turns and shifts as well as moments so beguiling we can imagine a sudden hush descend upon the chatterers! Wonderful music, here in superb performances by The Gaudier Ensemble, that take us back in time and out of our everyday bothers. ’Divertimento’ was an extremely popular musical title in mid-1700s Austria and southern Germany, an inclusive name, it would seem, for any instrumental work that could not be classed as a concerto or a symphony. ‘Divertimento’ would often be preferred to ‘Sonata’, a name that may have carried more serious connotations and suggested something less bright and elegant. Joseph Haydn described many of his early keyboard sonatas as divertimenti. Much later, H C Koch, in his Musikalisches Lexikon of 1802, defined ‘divertimento’ as music to please the ear, rather than expressing different shades of emotion. He added that the term was applied to music that eschewed contrapuntal elaboration and was not extensively developed in the manner of a sonata – the eighteenth-century equivalent of easy listening. 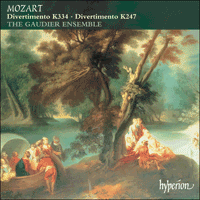 In Mozart’s output, ‘divertimento’ appears as the title of works for varied groupings of wind and/or stringed instruments; apart from the late Divertimento for string trio, K563, these all pre-date his move to Vienna in 1781 (though the divertimento style lived on in the three great wind serenades of the Viennese years (K361, K375 and K388), the string serenade Eine kleine Nachtmusik (K525), and the pieces for three basset horns (K439b). Between 1775 and 1780 he wrote two types of divertimento – short works for wind sextet, and four more extended compositions involving string and two horns, plus, in one case (K251), an oboe. Like nearly all Mozart’s music these were designed initially for specific occasions, and the three written for the same grouping of strings and horns (K247, K287, K334) also share a common six-movement form, framed by an opening sonata Allegro and a concluding rondo, the inner movements comprising two contrasting minuets, an Andante, and an Adagio for strings alone. This was the form that Mozart returned to in 1788 for the Divertimento for string trio, and which was then taken over by Beethoven in his Op 3 Trio, his Septet, and his Op 130 String Quartet. The Septet, in its turn, provided the model for Schubert’s Octet. The F major Divertimento K247 was written for Countess Antonia Lodron’s name-day celebration in June 1776. The Lodron family were important members of Salzburg’s aristocracy, and had provided a notable seventeenth-century archbishop, Count Paris Lodron. Antonia Lodron was the sister of the current Archbishop Colloredo, and an accomplished keyboard player. Mozart wrote the Concerto in F, K242 for her and her two daughters, who were both pupils of Leopold Mozart. In one letter Leopold writes about the Countess’s ‘usual insincere friendliness’, but it is clear that the Mozarts found her more sympathetic than her brother, and would ask her to sound out the Archbishop on their behalf, for example with regard to Wolfgang’s future employment at the court. The D major Divertimento’s origins are not quite so certain. Mozart refers to it as his ‘Robinig’ music – the Robinig von Rottenfelds were a well-to-do Salzburg family, and friends of the Mozarts; several of the family travelled to Munich in 1781 to attend the premiere of Idomeneo. It is most likely that K334 was composed to celebrate the successful completion of Sigismund von Robinig’s jurisprudence studies, in July 1780. … a happy medium between what is too easy and too difficult; they are very brilliant, pleasing to the ear and natural, without being vapid. There are passages here and there from which the connoisseurs alone can derive satisfaction; but these passages are written in such a way that the less learned cannot fail to be pleased, though without knowing why. If the F major Divertimento, which Mozart wrote in his twenty-first year, has a freshness and sense of excitement, stemming from the young composer’s realisation of the full extent of his powers of invention and organisation, the D major Divertimento K334 of four years later has a relaxed self confidence, reflected in the spacious design of the outer movements, and in a particularly powerful concept for the whole work – the first three movements are all based on inspiring upwardly striving themes, whilst for the last two the melodic ideas start at a high point and move downwards. The effect of Mozart’s grand scheme is enhanced by the noble sound of the lower-pitched horns in D. The Divertimento starts quietly, however, with the strings alone, and when the horns come in at the first forte, it is with their own new motif (Mozart repeats this idea at the start of the finale). Another feature of the Divertimento, giving Mozart an extra resource in filling out his expansive designs, is the important role allotted to the second violin, often given the task of introducing subsidiary ideas. In this opening movement the second subject and the closing passage of the exposition are both announced by the second violin. If Mozart himself played the difficult leader’s part at the first performance, could it be that Leopold played second violin? Another remarkable thing about K334’s first movement is its development section, during which the horns are silent. Beginning with a sudden modulation to a remote key (F major), the way back to the home key lies through a maze of rapidly shifting chromatic harmonies. Here, Mozart is certainly bewildering the ‘less learned’ amongst his listeners, whilst no doubt delighting the ‘connoisseurs’. The following Andante with variations also pushes at the boundaries of the divertimento form by being in a minor key. The tone is kept fairly light, through such ideas as the unison pizzicato presentation of the theme as accompaniment to the violin’s brilliant final variation, and the glowing, serenade-like colours of the major-key variation, where the horns assume the main thematic burden. But there are also plenty of the dark shadows typical of Mozart’s minor-key music – agitated syncopations, expressive chromatic harmonies, and impassioned, declamatory melodic lines. The first minuet takes us back to D major. In the early twentieth century this was one of Mozart’s best-known pieces, the suave elegance of the slurred pairs of notes that make up its melody seeming just as persuasive an evocation of eighteenth-century aristocratic manners as the gentle syncopations of the famous Boccherini minuet. Mozart was to return to this mood and to use a very similar texture, with viola doubling the violin line an octave lower (but without the delightful effect of the horns), in the trio of the minuet in his D minor Quartet, K421. The A major Adagio contrasts a detached, declamatory opening with the cantabile continuation on the violin. Soon, however, the two styles are combined, with the second violin leading an accompanying string trio. The whole movement impresses by its rich elaboration, the extravagant decoration of the melodic line supported by continually varied patterns in the lower instruments. The robust second minuet, with its memorable, strongly rhythmic theme and lively accompaniment, has two trios, both in a minor key. Even in the minuet itself there is a mysterious minor-mode episode, as though Mozart is recreating in miniature the contrast between D major and D minor of the Divertimento’s first three movements. And in the B minor second trio the pattern is reversed, a soft horn call appearing to push the music back to D major, followed each time by a return to the minor key. The final Rondo is very different from the one in K247, though its key-plan and sequence of events are quite similar. Instead of the short repeated sections of the earlier movement, repeats here are written out and varied. And instead of the sharply contrasting characters of each succeeding episode, the impression here is broader, with a spacious pastoral character. Along with the six-eight metre, this suggests a parallel with the finale of Mozart’s last instrumental work, the Clarinet Concerto. Even if we see Mozart’s final works as moving towards a new, more romantic style, it is fascinating to realize how many aspects of his later achievements are already present in the period of his early maturity. Au milieu du 18e siècle, « Divertimento » était un titre musical extrêmement populaire en Autriche et dans le sud de l’Allemagne. Ce terme intégrant, semblerait-il, était retenu pour toute œuvre instrumentale qui ne pouvait être qualifiée de concerto ou de symphonie. « Divertimento » était souvent préféré à « Sonate » aux connotations plus sérieuses qui suggérait quelque chose de moins brillant, de moins élégant. Joseph Haydn décrit une grande partie de ses sonates pour clavier comme des divertimenti. Bien plus tard, H C Koch, dans son Musikalisches Lexikon de 1802 définit le « Divertimento » comme une musique plaisante à écouter qui ne recherche nullement à exprimer différentes palettes d’émotions. Il ajoute que le terme qualifiait une musique qui évitait les élaborations contrapuntiques et n’était pas aussi largement développée qu’une sonate – l’équivalent d’une musique facile à entendre du 18e siècle. Dans la production de Mozart, « Divertimento » sert de titre à des œuvres conçues pour des ensembles variés associant instruments à vent et/ou à cordes. Hormis le Divertimento tardif pour trio de cordes, K563, tous virent le jour avant que Mozart ne vienne s’installer à Vienne en 1781 même si le style même du divertimento perdura à travers ses trois grandes sérénades pour vents des années viennoises – K361, K375 et K388 – la sérénade pour cordes Eine kleine Nachtmusik K525, et des pièces pour trois cors de basset K439b. Entre 1775 et 1780, Mozart écrivit deux types de divertimento – des œuvres courtes pour sextuor de vents et quatre compositions plus importantes comprenant des cordes et deux cors et en ce qui concerne K251, un hautbois. Comme presque toute l’œuvre de Mozart, ces divertimenti virent le jour pour des circonstances spécifiques. En outre, les trois destinés au même effectif, les K247, K287, K334 pour cordes et cors, ont aussi en commun une coupe en six mouvements encadrés par un allegro de sonate d’une part et un rondo conclusif de l’autre. Les mouvements centraux comprennent deux menuets contrastants, un Andante et un Adagio pour cordes seules. C’est à cette forme que Mozart revint en 1788 en écrivant son Divertimento pour trio à cordes. C’est elle qui fut ensuite reprise par Beethoven dans son Trio opus 3, son Septuor et son Quatuor à cordes opus 130. A son tour, le Septuor servit de modèle à l’Octuor de Schubert. Le Divertimento en fa majeur K247 fut écrit pour la fête de la Comtesse Antonia Lodron en juin 1776. Figure majeure de l’aristocratie salzbourgeoise, la famille Lodron comptait dans ses rangs un archevêque illustre du 17e siècle, le Comte Paris Lodron. Sœur de Colloredo, l’archevêque qui régnait alors sur Salzbourg, Antonia jouait très bien du clavier. C’est pour elle et ses deux filles, élèves de son père, que Mozart écrivit le Concerto en fa majeur K242. Si dans une de ses lettres, Leopold Mozart parle de « l’amitié hypocrite usuelle » de la comtesse, il est clair que les Mozart la trouvaient plus sympathique que son frère et lui demandaient de sonder l’archevêque pour eux, notamment à propos du futur emploi de Mozart à la cour. Les origines du Divertimento en ré majeur ne sont pas aussi certaines. Mozart y fait référence comme étant sa musique Robinig – autre famille aisée de Salzbourg, les Robinig von Rottenfelds étaient des amis des Mozart ; plusieurs de ses membres se rendirent à Munich en 1781 pour la première d’Idomeneo. K334 fut très probablement écrit pour célébrer les études de droit que Sigismund von Robinig avaient brillamment achevées en juillet 1780. … Un genre heureux entre ce qui est trop facile et trop difficile ; très brillants, ils plaisent à l’oreille et sont naturels sans être insipides. Il y a des passages çà et là dont seuls les connaisseurs tireront de la satisfaction, mais ces passages sont écrits de telle façon que les moins érudits ne pourront qu’en être ravis, sans pour autant savoir pourquoi. Le Divertimento en fa majeur que Mozart écrivit à vingt-et-un ans, possédait une fraîcheur et un sens de l’excitation jaillissant de l’esprit d’un jeune compositeur conscient de la pleine étendue de ses pouvoirs d’invention et d’organisation. Ecrit quatre ans plus tard, le Divertimento en ré majeur K334 fait preuve d’une assurance confiante et détendue que reflètent la conception spacieuse des mouvements externes et la conception particulièrement puissante de toute l’œuvre – les trois premiers mouvements sont élaborés sur des thèmes qui s’élancent en mouvements ascendants tandis que les deux derniers s’appuient sur des idées mélodiques initiées au sommet pour ensuite descendre. L’effet de schéma général de Mozart est accentué par la sonorité noble des cors plus graves en ré. Le Divertimento débute avec calme, cependant, par les cordes seules, puis lorsque les cors se font entendre avec le premier forte, c’est avec un élément thématique nouveau qui leur est propre (Mozart reprend cette idée au début du finale). Un autre trait du Divertimento, qui offre à Mozart une ressource supplémentaire pour étoffer ses ambitieux concepts, se trouve être le rôle majeur conféré au second violon, qui a souvent la charge d’introduire des idées secondaires. Dans le premier mouvement, le second thème et le passage conclusif de l’exposition sont tous deux énoncés par le second violon. Si Mozart lui-même jouait la partie difficile de premier violon lors de la création, se pourrait-il que Leopold ait tenu celle de second violon ? Autre élément remarquable du premier mouvement de K334, sa section de développement omet les cors. Débutant par une brusque modulation dans une tonalité éloignée (fa majeur), elle retrouve la tonalité principale à travers un labyrinthe de changements chromatiques rapides de l’harmonie. A travers cet épisode, Mozart époustouflait certainement ses auditeurs les moins érudits tout en faisant les délices des connaisseurs. L’Andante qui s’ensuit, avec ses variations, repousse également les limites de la forme de divertimento puisqu’il est écrit en mineur. Le climat demeure relativement léger grâce à des idées consistant à utiliser le thème énoncé à l’unisson, en pizzicato, pour accompagner la dernière variation brillante du violon ou à faire scintiller les couleurs aux allures de sérénades dans la variation en majeure, les cors étant en charge du thème principal. On trouve aussi des zones d’ombre caractéristiques de la musique en mineur de Mozart – des syncopes agitées, des harmonies chromatiques expressives et passionnées, des lignes mélodiques déclamatoires. Le premier menuet nous ramène vers ré majeur. Au début du 20e siècle, c’était une des œuvres les plus connues de Mozart ; l’élégance suave des notes liées deux à deux qui constituent sa mélodie semblent être une évocation aussi persuasive des manières aristocratiques du 18e siècle que les douces syncopes du célèbre menuet de Boccherini. Mozart retrouva cette même atmosphère et une texture quasiment semblable – l’alto doublant la ligne du violon à l’octave inférieure (mais sans le délicieux effet des cors) dans le trio du Menuet de son Quatuor en ré mineur K421. L’Adagio en la mineur contraste une introduction détachée et déclamatoire avec la continuation cantabile du violon. Peu après, cependant, les deux styles s’associent, avec le second violon menant un trio accompagnateur de cordes. Tout le mouvement est imprégné de sa riche élaboration, de son ornementation extravagante de la ligne mélodique soutenue par ses motifs toujours variés aux instruments graves. Le second menuet robuste avec son thème mémorable et fortement rythmique comporte deux trios en mineur. Même dans le menuet lui-même figure un épisode mystérieux en mineur, comme si Mozart recréait en miniature le contraste entre les ré majeur et mineur des trois premiers mouvements du Divertimento. Comme dans le second trio en si mineur, le motif est inversé, un doux appel de cor apparaissant pour reconduire la musique en ré majeur, suivi chaque fois par un retour du mineur. Le Rondo final est très différent de celui de K247, même si sa structure tonale et la séquence des événements se ressemblent. Au lieu de reprendre des courtes sections du mouvement précédent, les reprises sont écrites dans leur intégralité et variées. Au lieu de contraster fortement les caractères de chaque épisode qui se succède, Mozart donne l’impression d’un vaste tableau de caractère pastoral accentué par une mesure à 6/8. Tout concourt pour suggérer un parallèle avec le finale de la dernière œuvre instrumentale de Mozart, le Concerto pour clarinette. Même si l’on peut considérer que les dernières compositions de Mozart évoluent vers un style nouveau et plus romantique, il est tout aussi fascinant de réaliser à quel point celles-ci sont déjà présentes dans les pages de sa première maturité. In Österreich und Süddeutschland war “Divertimento” in der Mitte des 18. Jahrhunderts eine äußerst beliebte Bezeichnung für Musikstücke. Es scheint, als ob dieser Begriff großzügig auf all jene Instrumentalwerke angewandt wurde, die man nicht als Konzert oder Sinfonie einstufen konnte. Oft wählte man die Bezeichnung „Divertimento“ anstelle von „Sonate“, weil letztere möglicherweise an ein ernsteres Stück und etwas weniger Helles und Elegantes denken ließ. Joseph Haydn bezeichnete viele seiner frühen Klaviersonaten als Divertimenti. Viel später definierte H. Ch. Koch in seinem Musikalischen Lexikon von 1802 „Divertimento“ als Musik, die dem Ohr gefällig ist anstatt verschiedene Gefühlsschattierungen auszudrücken. Koch fügte hinzu, dass der Begriff „Divertimento“ auf Musik Anwendung fand, die kontrapunktische Ausarbeitung vermied und nicht so ausgiebig durchgeführt wurde, wie das bei einer Sonate der Fall war. Ein Divertimento war also das damalige Äquivalent zur Leichten Musik von heute. In Mozarts Oeuvre erscheint die Bezeichnung „Divertimento“ als Titel für Werke mit unterschiedlichen Aufstellungen von Blas- und/ oder Streichinstrumenten. Außer dem späten Divertimento für Streichtrio, KV563 wurden alle seine Divertimenti vor seinem Umzug nach Wien 1781 komponiert (auch wenn der Divertimento-Stil in den drei großen Bläserserenaden aus seiner Wiener Zeit (KV361, KV375 und KV388), der Streicherserenade Eine kleine Nachtmusik (KV525) und den Stücken für drei Bassetthörner (KV439b) fortlebte). Zwischen 1775 und 1780 schrieb Mozart zwei Arten von Divertimenti – kurze Werke für Bläsersextett und vier umfangreichere Kompositionen für Streicher und zwei Hörner, denen sich in einem Fall (KV251) eine Oboe hinzugesellte. Wie fast alle Werke Mozarts waren diese Divertimenti ursprünglich für bestimmte Anlässe bestimmt. Die drei Werke, die für Streicher und Hörner komponiert wurden (KV247, KV287, KV334), zeichnen sich auch durch die gleiche sechssätzige Form aus, deren Rahmen durch ein Sonatenallegro am Anfang und ein abschließendes Rondo gebildet wird, wobei die mittleren Sätze jeweils zwei kontrastierende Menuette, ein Andante und ein Adagio, ausschließlich für Streicher vorzuweisen haben. Zu dieser Form sollte Mozart in seinem Divertimento für Streichtrio 1788 zurückkehren. Auch Beethoven nahm sich dieser Form in seinem Trio op. 3, seinem Septett und seinem Streichquartett op. 130 an. Das Septett diente wiederum als Vorlage für Schuberts Oktett. Das Divertimento in F-Dur, KV247 wurde für die Feier zum Namenstag der Gräfin Antonia Lodron im Juni 1776 geschrieben. Die Lodron-Familie war ein wichtiges Mitglied der Salzburger Aristokratie und zählte einen berühmten Erzbischof des 17. Jahrhunderts, Graf Paris Lodron, zu den Ihrigen. Antonia Lodron war die Schwester des zu Mozarts Zeiten wirkenden Erzbischofs Colloredo und selbst eine fähige Pianistin. Mozart schrieb sein Konzert in F, KV242 für sie und ihre zwei Töchter, die beide Schülerinnen von Leopold Mozart waren. In einem Brief schrieb Leopold einmal über die „übliche unaufrichtige Freundlichkeit“ der Gräfin, aber die Mozarts fanden sie offensichtlich sympathischer als ihren Bruder und baten sie, die Stimmung des Erzbischofs zu erkunden, zum Beispiel, als es um Wolfgangs zukünftige Anstellung am Hofe ging. Über die Herkunft des Divertimentos in D-Dur ist man sich nicht ganz so sicher. Mozart nannte es seine Robinig-Musik – die Robinigs von Rottenfeld waren eine bemittelte Salzburger Familie und Freunde der Mozarts. Einige Familienmitglieder reisten 1781 nach München, um der Premiere von Idomeneo beizuwohnen. Es ist sehr wahrscheinlich, dass KV334 komponierte wurde, um den erfolgreichen Abschluss von Sigismund von Robinigs Studien der Jurisprudenz im Juli 1780 zu feiern. Sowohl Leopold als auch Wolfgang nennen diese Werke manchmal „Cassation“. Der Begriff ist ziemlich vieldeutig. Er lässt sich möglicherweise auf das Wort „Gasse“ zurückführen und meint damit Musik, die draußen auf der Straße gespielt wurde – es gibt in den Mozart-Briefen tatsächlich einen Hinweis auf eine Freiluftaufführung der Stücke KV247 und KV287. Aber die meisten Aufführungen scheinen drinnen stattgefunden zu haben. Wolfgang und sein Vater schätzten diese Werke sehr hoch, auch wenn es gelegenheitskompositionen waren. In einem ungehaltenen Brief vom 11. Dezember 1777 an Wolfgang in Mannheim tadelte Leopold seinen Sohn, weil er sich zur Förderung seiner Karriere am kurfürstlichen Hof angeblich nicht im besten Licht vorgestellt hätte. Der Vater fragte, warum Wolfgang am Mannheimer Hof weder seine Haffner-, noch seine Lodron-Serenaden vorstellte.† Das lässt darauf schließen, dass Leopold KV247 und KV287 zu Wolfgangs feinsten Kompositionen zählte. Zudem hätte es Leopold sicher gern gesehen, wenn sein Sohn neben seinen Auftritten als Cembalospieler auch mittels der genannten Stücke als Violinist in Erscheinung getreten wäre. Am 4. Juli 1781 schrieb Mozart, erst kürzlich aus den Diensten des Erzbischofs von Salzburg entlassen, aus Wien an seinen Vater, dass er dringend die drei Cassations bräuchte – besonders die in F, KV247 und die in B, KV287, und später auch die in D, KV334. Hier versuchte Mozart vielleicht seinen Vater mit dem Vorschlag zu besänftigen (der über die unbeherrschte Art und Weise bestürzt war, mit der sein Sohn seinen Streit mit dem Erzbischof geführt und beendet hatte), dass er gern seine Erfolge als Violinist wiederholen möchte. Wiederum wird man auf die drei Werke verwiesen, auf die Vater und Sohn besonders stolz waren. Violinisten können wirklich bedauern, dass Mozart in Wien dann doch nicht als Violinist in Erscheinung getreten ist und damit keine neuen Konzerte zu den 1775 komponierten hinzugefügt bzw. weitere Werke zu den genannten Divertimenti mit ausgearbeiteter Solostimme für die erste Violine geschrieben hat. Nun verweisen diese Divertimenti mit ihren satten und ständig variierten Texturen, ihrer wunderbaren Stimmführung, die alle Stimmen an einem musikalischen Einfall teilhaben lässt, und ihren flexiblen, dramatisch belebten Formverläufen schon voraus auf die großen Streichquartette und -quintette aus Mozarts Wiener Zeit. Die Musik dieser Divertimenti bewegt sich gerade noch in den Grenzen der gefälligen, relativ anspruchslosen Unterhaltung, und es lohnt sich unbedingt, aufmerksam und konzentriert zuzuhören. So könnte man Mozarts Beschreibung seines ersten Wiener Klavierkonzerts (KV413-415) ebenso auf die Divertimenti anwenden: Sie wären ein gutes Mittelmaß zwischen dem, was zu schwer und dem, was zu leicht sei. Ohne seicht zu sein, zielten diese Werke auf Gefälligkeit. Die eine oder andere Passage würde vielleicht nur dem Kenner zusagen, aber diese Passagen wären in einer Art komponiert, die dem weniger Kundigen nicht missfallen könnten, auch wenn sie nicht wussten, warum sie ihnen gefiel. Im Gegensatz zum Divertimento in F-Dur, das Mozart im Alter von 20 Jahren schrieb und das sich durch eine Frische und ein Gefühl der Erregung auszeichnet, die wohl dem Bewusstwerden des jungen Komponisten über das volle Ausmaß seiner Erfindungskraft und seines kompositorischen Organisationstalents zuzuschreiben sind, präsentiert sich das vier Jahre später komponierte Divertimento in D-Dur K334 mit entspannter Selbstsicherheit, die in der großräumigen Anlage der Außensätze und in einem besonders wirksamen Konzept des gesamten Werkes zum Ausdruck kommt – die ersten drei Sätze beruhen alle auf animierenden aufwärts strebenden Themen, während die melodischen Gedanken der letzten zwei Sätze hoch anfangen und sich abwärts bewegen. Die Wirkung von Mozarts großformalem Schema wird vom noblen Klang der tiefer liegenden Hörner in D nur noch bereichert. Das Divertimento beginnt allerdings leise mit den Streichern allein, und wenn die Hörner beim ersten Forte einsetzen, geschieht das mit ihrem eigenen Motiv (Mozart wiederholt diesen Gedanken zu Beginn des Schlusssatzes). Eine weitere Eigenheit des Divertimentos, die Mozart ein zusätzliches Mittel zum Ausfüllen seines ausgedehnten Konzepts liefert, ist die wichtige Rolle, die der zweiten Violine zugeordnet wird. Ihr fällt häufig die Aufgabe zu, Nebengedanken vorzustellen. In diesem Kopfsatz werden sowohl das zweite Thema als auch die abschließende Passage der Exposition von der zweiten Violine angekündigt. Sollte Mozart tatsächlich die schwierige Stimme der ersten Violine bei der Uraufführung gespielt haben, könnte es dann sein, dass Leopold die zweite Violine spielte? Ein weiteres bemerkenswertes Merkmal des Kopfsatzes von KV334 ist der Durchführungsabschnitt, in dem die Hörner schweigen. Mit einer unerwarteten Modulation zu einer entfernten Tonart (F-Dur) beginnend führt der Weg zurück zur Grundtonart durch ein Labyrinth von rapide wechselnden chromatischen Harmonien. Hier verstörte Mozart mit Sicherheit die „weniger kundigen“ Hörer, während er zweifellos den Kenner in Entzücken versetzte. Das folgende Andante mit Variationen stellt ebenso die Grenzen der Divertimento-Form in Frage, da es in einer Molltonart steht. Es wird ein ziemlich leichter Ton angeschlagen dank solcher Ideen wie der Einsatz des Themas als unisono gespielte Pizzikatobegleitung zur virtuosen Violine in der Schlussvariation, oder die leuchtenden, Serenaden-artigen Klangfarben in der Dur-Variation, in der die Hörner die thematische Hauptlast tragen. Aber es gibt auch viele dunkle Schatten, die für Mozarts Musik in Moll typisch sind – erregte Synkopen, ausdrucksvolle chromatische Harmonien und leidenschaftliche, deklamatorische melodische Linien. Das erste Menuett führt uns zurück nach D-Dur. Im frühen 20. Jahrhundert gehörte dieser Satz zu einem von Mozarts bekanntesten Stücken: die geschliffene Eleganz der gebundenen Notenpaare, aus denen sich die Melodie zusammensetzt, scheint die aristokratische Manier des 18. Jahrhunderts genauso überzeugend zu beschwören wie die zarten Synkopen des berühmten Menuetts von Boccherini. Mozart sollte im Trio des Menuetts aus seinem Quartett in d-Moll, KV421 zu dieser Stimmung zurückkehren und eine sehr ähnliche Textur schaffen (wenn auch ohne den reizenden Effekt der Hörner), bei der die Viola eine Oktave tiefer parallel zur Violinestimme verläuft. Das Adagio in A-Dur kontrastiert eine distanzierte, deklamatorische Einleitung mit einer cantabile vorgetragenen Fortführung der Violine. Bald werden die beiden Stile aber miteinander verbunden, wobei die zweite Violine ein begleitendes Streichtrio anführt. Der ganze Satz beeindruckt durch seine detaillierte Ausarbeitung und seine extravaganten Verzierungen der melodischen Linie, die von ständig variierten Gesten in den tiefen Instrumenten unterstützt wird. Das robuste zweite Menuett mit seinem einprägsamen, stark rhythmischen Thema und seiner lebhaften Begleitung hat zwei Trios, beide in Moll. Selbst in den eigentlichen Menuettabschnitten gibt es mysteriöse, nach Moll neigende Episoden, als ob Mozart den Kontrast zwischen D-Dur und d-Moll aus den ersten drei Sätzen des Divertimentos en miniature nachschaffen möchte. Im zweiten Trio in h-Moll ist das Muster nun umgekehrt: ein sanfter Hornruf scheint die Musik nach D-Dur zurückrufen zu wollen, wird jedoch jedes Mal von einer Rückkehr nach Moll gefolgt. Das abschließende Rondo unterscheidet sich von dem entsprechenden Satz aus dem Divertimento, KV247 erheblich, auch wenn das Tonartenschema und die Abfolge der Ereignisse ziemlich ähnlich sind. Statt der kurzen wiederholten Abschnitte in KV247 sind die Wiederholungen in diesem Divertimento ausgeschrieben und variiert, und anstelle der scharf kontrastierenden Stimmungen der aufeinander folgenden Episoden entsteht hier ein weitgefassterer Eindruck mit einem großräumigen pastoralen Charakter. Auch der 6/8tel Takt legt den Vergleich mit dem Schlusssatz aus Mozarts letztem Werk, dem Klarinettenkonzert, nahe. Es ist sicher gerechtfertigt, Mozarts letzte Werke als Wegweiser zu einem neuen, romantischeren Stil zu begreifen, aber es ist auch faszinierend zu sehen, wie viele Aspekte seiner späten Errungenschaften schon in der Periode seiner frühen Reife vorhanden sind.